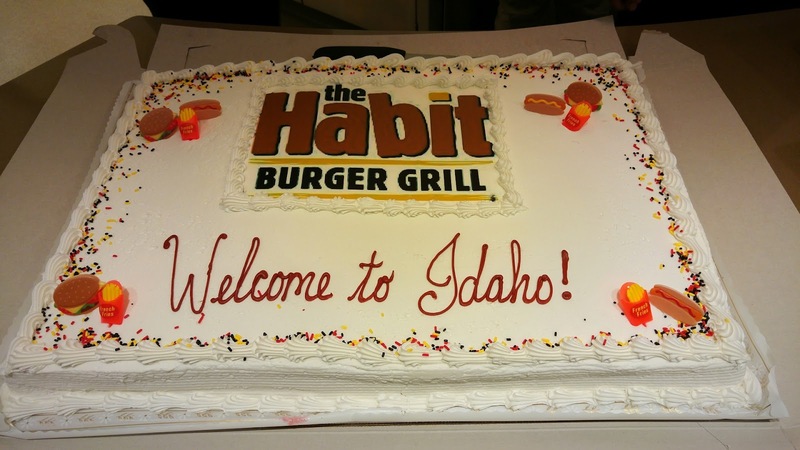 Treasure Valley Treats and Tragedies: The Habit Burger Grill - Grand Opening today! The Habit Burger Grill - Grand Opening today! 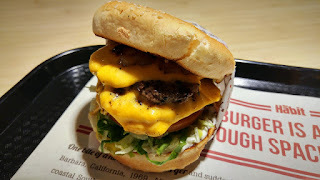 I know you're probably shocked that I'm writing about a burger joint, since they only comprise about a third of my reviews. What can I say, they're a weakness of mine. 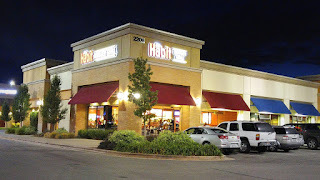 Habit has about 125 locations spread throughout the West (and interestingly Florida, New Jersey, and Virginia as well), but this was my first time visiting one. They started in Santa Barbara back in 1969, and were a family-owned business all the way up until 2007, which is pretty damned impressive. I don't know how many locations they had at the time they were bought out, but describing their current expansion as rapid would be putting it mildly. When I showed up the entire menu was available, save for the desserts. 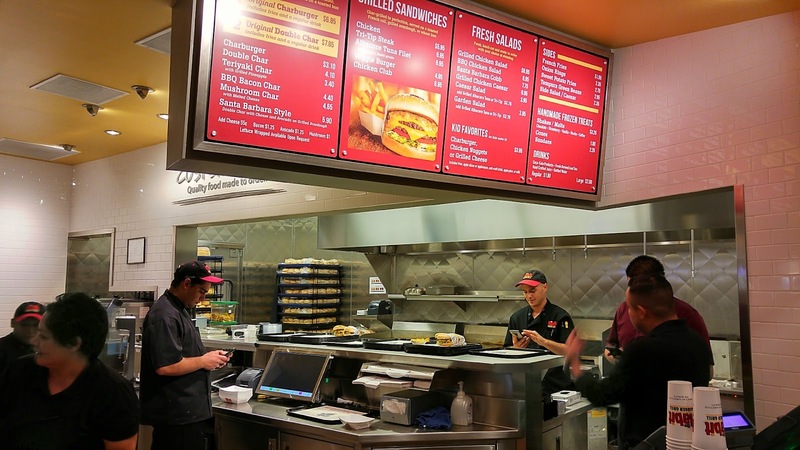 Prices are very competitive for the higher-end fast food/fast casual market. I mean three bucks for a burger? Especially one that hasn't seen the inside of a freezer? 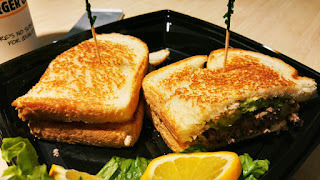 They also have grilled ahi (line caught sushi grade) sandwiches, some very tempting salads, some chicken and steak options, and nothing on the menu costs more than eight dollars, but let's be serious here: how could I not get a burger the first time? Habit's burgers edged out In-N-Out and Five Guys in Consumer Report's 2014 poll, after all. 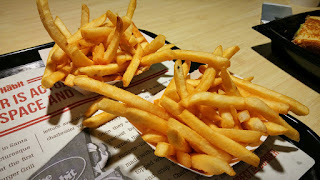 I decided to go with the classic Double Char, fries and a drink. I wasn't going to request any add-ons, but I couldn't bring myself to decline cheese when it was offered. The ex-roommate's teen daughter...I really need to come up with nicknames or something for my cast of regulars. Anyway, she prefers her burgers plain, but since avocado is one of the few plant-based foods she can stand I talked her into the Santa Barbara Style, a double burger with cheese and avocado on grilled sourdough. We were given a buzzer and cups, and headed off to find a booth. 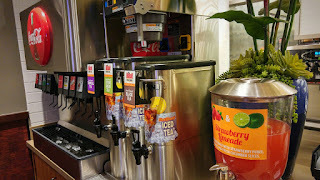 Drinks are self serve, and there are some interesting tea and lemonade options in addition to the usual Coke products. More interesting still is the small toppings bar, with its variety of peppers and sauces. 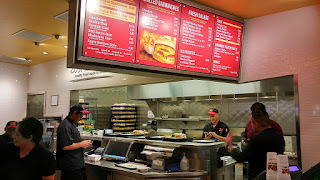 As busy as it was, our order came up almost immediately after I brought the drinks and obligatory fry sauce to the table. I was somewhat remiss in not trying my dining companion's sandwich, but she assured me it was a solid 8/10. With my weakness for sourdough and avocado, I'm sure I'll be ordering one of my own soon enough. ...of my Double Char. Two flame-grilled patties, still a little pink inside, each topped with a slice of perfectly melted cheese. Plus shredded lettuce, mayo, tomato, caramelized onions, and pickle, on a toasted bun. I cannot possibly emphasize how much better a toasted bun makes a burger. Delicious would be the simplest way to put it. The burger was cooked just right, charred without being burnt. The veggies were fresh. Everything was perfectly balanced, with no one flavor overwhelming the others. It was deceptively small looking until I had to practically unhinge my jaw to get it in my mouth. It's also on the juicy side, so I'd recommend leaving that tight paper wrapping on until you absolutely have to remove it. Once I finished it I turned my attention back to my fries, but I was pretty much at the wall by that point. The teen and I could have easily shared an order. The sweet potato fries and onion rings I saw other people walking by with looked extremely promising as well, but they will have to wait for another time. As dinner service wrapped up, various management types got on the P.A. to thank their staff for rising to the challenge, and to recognize the employees from other stores who had taken a few days or weeks away from their lives to get the new location up and running. I was the closest thing to a media type there by that point, so none of it was done for false benefit. I've been to several "friends and family" openings, but this is the first one that really felt deserving of that designation. There was much expression of gratitude and applause, and at the end a giant cake was cut. I was invited to partake, but I simply couldn't take another bite of anything. And I hadn't even finished my meal! I look forward to returning to Habit as a paying customer. In a few weeks or so. Something tells me it's going to be hard to get a table there for a while.